A gang of inluenza virions earlier today. Bastards. Since Saturday, I’ve been laid low by lurgy, specifically ‘flu. Like most men, I’m a terrible patient and Ele’s had to put up with a lot of whimpering, mewling and general ‘take care of me’ whimsy. The illness even has its own season – from November to April, with most cases occurring between late December and early March. Thankfully I’ve not had any vomiting or diarrhea, though I did have a bit of delerium, which was horrible. And a lot of bone ache. I can feel the inside of my shoulder bones when I move my arms. It’s most disconcerting. At the same time, I do find it fascinating that inside my body, there’s a bitter war going on. My body is now pumping out antibodies tailored to the specific virus that’s invaded it. Pretty marvellous, really. 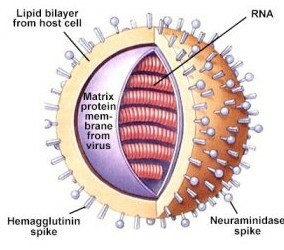 But the virus itself is quite amazing. Such a tiny scrap, a few bunches of RNA, and it can cause such disruption (millions of deaths) just by carrying out the only form of reproduction it can: hijacking animals’ cells and getting them to make its babies. Hope you like it. Maybe I should put a funky backbeat underneath it or something? Could be a hit! I’m looking forward to getting better and gambolling in the sunshine once more, like a tubby lambkin. The Blair Iraq Cover Up Contd.